Samuel "Sam" Houston was the seventh governor of Texas and a man of colorful character who played a crucial role in gaining Texas' independence from Mexico and joining the United States. He was also the only governor of a Southern state to campaign against secession from the Union in the lead up to the Civil War. Due to his refusal to swear his allegiance to the Confederacy, he was thrown out of office. 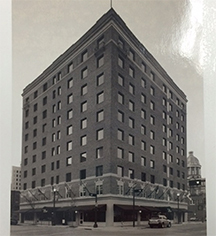 In 1924, a group called The Sam Houston Hotel company enlisted the architecture firm Sanguinet, Staats, Hedrick, & Gottlieb to build the 10-story, 200 guestroom hotel with budget-minded business travelers and those with an overnight layover between trains. The Sam Houston Hotel was ideally located just a few blocks away, near present-day Minute Maid Park. Guests could rent a room for a mere $2 per night. If they felt like splurging, they could pay an extra 50¢ and receive a room with a private bathroom. The first floor housed many different shops over the years, including a barber shop, a clothing store, a coffee house, and a bar. 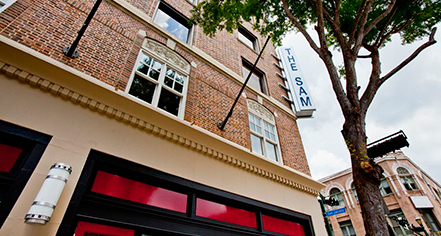 Finally, in 1973, due to poor economic conditions and dwindling patronage, The Sam closed its doors. The building sat vacant and unused for three decades. In October 2002, The Sam opened to greet the new century after comprehensive renovations while maintaining its rich and historic glory. Nowadays, the historic hotel boasts 100 beautifully appointed guestrooms, including nine suites. The Pearl Restaurant and Bar is now housed on the first floor and serves a delicious Continental menu. Private dining space is available at the Pearl Restaurant and Bar for special functions and events. Across the hall, the bar is a popular local hangout, especially during sports games. The Veranda by The Pearl Restaurant and Bar is an award winning indoor-outdoor private event space and is often featured as a top wedding location. Two boardrooms located on the second floor round out The Sam Houston Hotel's versatility as an ideal venue for business meetings and events. The hotel was acquired by American Liberty Hospitality in 2012 and underwent a complete renovation of the entire hotel, which was finalized in spring 2013.